Year 12 students from the Canberra Institute of Technology (CIT) had a once-in-a-lifetime opportunity to participate in a ZeroCO2 Hackathon this March at CIT Bruce. 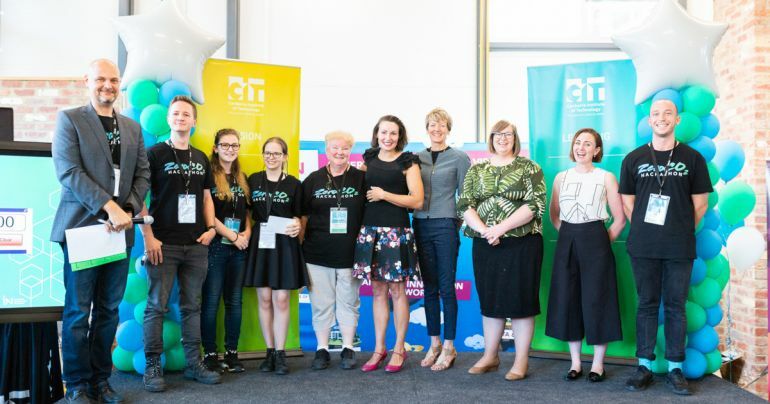 Facilitated by the Canberra Innovation Network and Neoen, the ZeroCO2 Hackathon was a gruelling 30-hour event that challenged nine teams to develop a business solution to enhance the lives of every day Canberrans and help reduce CO2 emissions. Competing alongside teams from the Australian National University and University of Canberra, the two Year 12 teams said they gained invaluable skills of teamwork and project management by being involved in the competition. Local Entrepreneur Hollie Bell and CIT Manager People Performance and Culture Jason Washington-King were team mentors. Hollie said the event has opened up the students’ minds to think about new careers. "The energy in the room was overwhelming and the skills these students have learnt along the way has definitely built their confidence to help them with their next career challenge," Hollie said. The hackathon generated much enthusiasm and gave students new social connections and a chance to interact with the local thriving innovation community. "My team came in second place and Jason’s team received a mentor’s prize - both of which are huge achievements. The judges were suitably impressed that such young teams could articulate their ideas so clearly." The chance to not only embark on an academic journey but to do something which could potentially make a difference to the global issue of climate change was a motivator for many of the students. Find out more about our Pathways courses and Year 12 studies here.